Built by the emperor Hadrian in honor of Trajan on the highest point of the Acropolis, perhaps over an older sanctuary of Zeus, this sanctuary became, in reality, the cult center of the two emperors. The complex is a typical example of Roman sanctuary architecture in the East, of which it amplifies the characteristics of axiality, frontality, symmetry, and spectacularity. In fact, at the center of a vast porticoed courtyard, with a frontal view accentuated by a monumental staircase, stands the peripteral Corinthian temple on a tall podium, with six columns at the front and nine at the sides. The courtyard and porticoes stand on an artificial terrace measuring 68 x 58 meters, created with large vaulted substructions. In particular, underneath the temple podium are three parallel rows of three vaults each, arranged widthwise. These vaults also bore the weight of the staircase leading to the temple, and communicated with one another by means of arched openings, the purpose of which was to aid the circulation of air and keep the walls dry. A great retaining wall (more than 70 meters long) ended the terrace to the south. The courtyard around the temple was paved in slabs of trachyte stone of different widths. 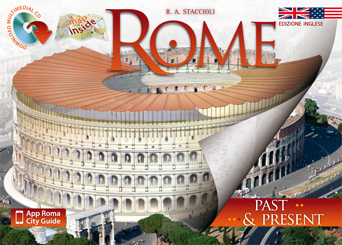 The entire complex has been subjected to thorough and accurate restoration work. 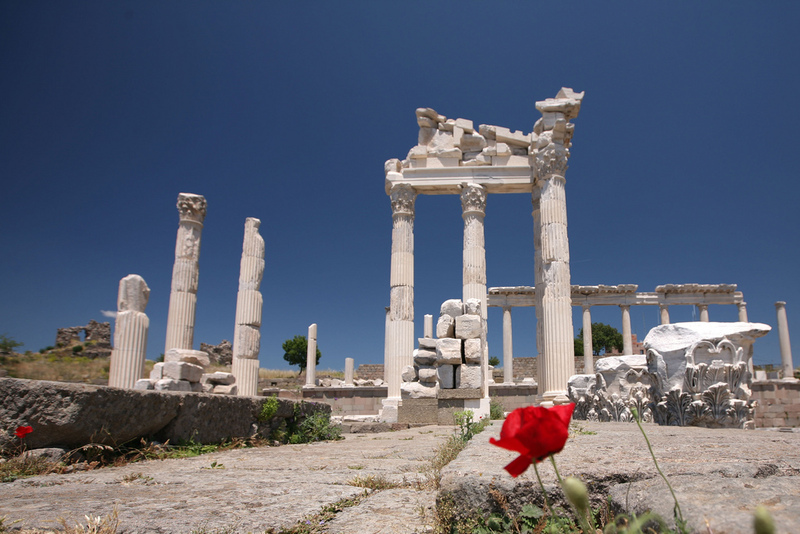 Do you want to know more about the history of Ephesus and Pergamon? 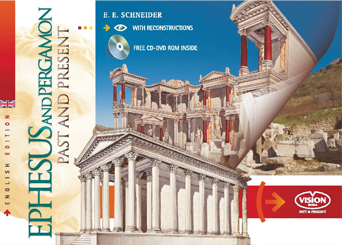 Check out our guidebook to Ephesus and Pergamon, with detailed history and Past & Present images of their greatest historical and archaeological sites.